Socialization is a hot button issue in homeschooling circles. Even with homeschooling becoming more and more mainstream, it’s still one of the things that new and prospective homeschoolers ask about first. It’s also still the thing most likely to trigger a defensive reaction from the homeschool community. The defensiveness is really not needed though. A lot of longtime homeschoolers know that homeschooling has the potential to provide a better social experience for kids than school. It’s not something that I or most of my homeschool parent friends have worried about for a long time. At this point, we really only see the benefits. While you have to work at it a little, there are a lot of potential social benefits to homeschooling. Homeschoolers are like any other group of kids. There can be bullies. However, systematic bullying isn’t something that happens much in homeschooling. Especially in the early grades, when bullying behaviors first happen, adults who are more likely to trust a child’s story and validate their experiences are just more present and available in homeschool groups than at school. That’s the parents of the victim and the perpetrator. Kids always have an adult in their corner and these situations rarely get out of hand the way they can in schools. There’s a ton of pressure in schools to be like everyone else. That includes liking the things everyone else likes and conforming to the expectations people have of kids based on their gender, their parents, their neighborhood, and a million other things. Girls are expected to be girly, boys to like sports, kids from poor neighborhoods to be rough, kids with wealthy parents to be refined. Homeschooled kids usually feel much freer to pursue interests that aren’t necessarily the most popular. Homeschool groups I’ve known have been more accepting of kids who have interests outside the most popular ones, especially kids with academic interests and kids who have interests outside what’s considered common for their gender, such as girls interested in engineering and boys drawn to the arts. School is often a singular social outlet for kids. If they don’t fit into their class, they don’t really have a chance. For introverts, being there are all day can be exhausting. Homeschoolers have the chance to create multiple outlets that are suited for the individual kid and are at a child’s pace. There’s nothing inherently better about being in a classroom all day with other kids. A lot of kids learn better away from the social stress of being surrounded by kids and are better able to form friendships outside the stress of the classroom as well. Schools often emphasize group work and class discussion as essential ways to learn social skills. It is important to learn to work with others, but the type of school work done in the classroom is rarely a good way to learn it. Sports teams, scouting groups, robotics teams, and other groups where kids are there by choice, working together on projects or competitions that challenge them in more creative ways, are so much better. School kids do those things too, but homeschooling leaves more time to make those things more central to learning. It allows them to be the primary way your kid learns how to work with others, instead of through some of the less desirable ways that happen in the classroom. One of the things that you’ll see people say about homeschoolers is that they’re often good at talking to adults. Not only that, but they’re excellent at dealing with younger kids, even homeschoolers who don’t have younger siblings themselves. It’s important for kids to have friends who are near their age. However, schooled kids often miss out on having the chance to have friends who aren’t near their age, or are just a year apart, because they’re so age segregated. Being in a more multi-age environment is so beneficial to kids. Like the one room schoolhouse of generations ago, it gives kids the chance to see mentors near their age and to teach and mentor younger kids in turn. It helps kids see that knowledge and skills don’t have to be tied to a specific age. It also makes them less intimidated by adults and more open to asking questions. Along with being able to talk to adults, one thing I’ve found is that homeschoolers in general often have more opportunities to practice talking to others. Talk in the classroom mainly consists of teacher talk and structured interactions. In homeschooling, you just have more opportunities to practice the art of conversation. Homeschoolers have lots of great ways to do it, as well. Sipping tea and talking about poetry is a great homeschool tradition, but there are so many ways that homeschoolers can have more time to have meaningful conversations with peers and adults. Schools tend to babysit students far past the age when they could be doing some things more on their own, while making them fend for themselves when they struggle with academics. Homeschooling can be about giving students more independence. It can afford kids the independence to choose their own course of study, to attend classes with older students, to have internships and do community service at a younger age, or to pursue passion projects and have independent learning time. It can allow them space to be free range and play outside more often. It can do this while giving them the one on one support they need academically. Homeschooled kids often take a little longer to find their way to independence, but once they do, in my experience, they navigate the world with more confidence at a younger age. Finally, schools tend to be static places where kids take very few field trips and spend most of their time with a single, insulated group. Homeschoolers can be out in the world, not only doing things like visiting museums and zoos, but also just talking with everyday people. Homeschooling can mean time to travel, either locally, regionally, or around the world. There’s no much better for socialization than meeting a wide variety of people. Homeschooling isn’t always a utopia for socializing. In some communities, homeschooling can make it tough to find friends. If your family has different values from most of your community or if you live in a rural area where school is the only social hub, it can be tricky. It’s also important for parents to be willing to put themselves out there. These opportunities don’t just materialize out of nowhere for most families, especially when kids are younger. It can take parents making intentional decisions not to shelter their kids and to try new things with them. However, for most of us, not only are there social opportunities, but the quality of interactions that our kids get are better than what’s available in schools. That’s why, when I see new homeschoolers ask about socialization, I have to fight the attempt to roll my eyes. 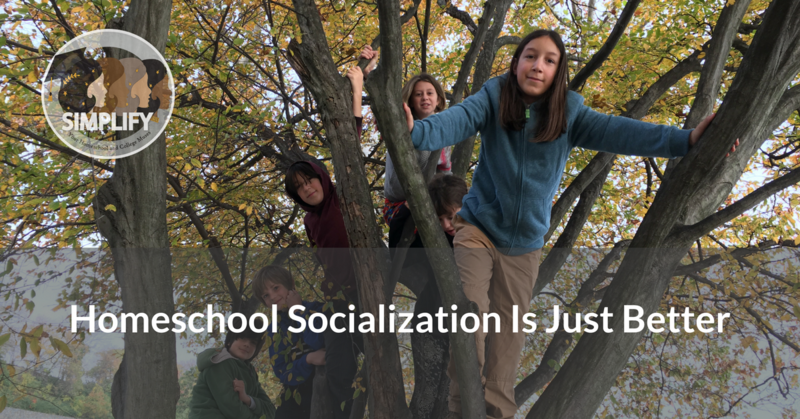 Socialization in homeschooling has been nothing but positive from our perspective.